This place is still intact. But it is no longer a pub. 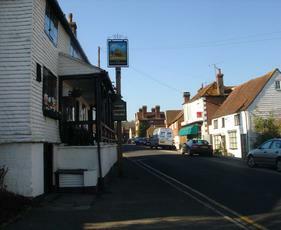 The Anchor is just opposite and still open. Not a bad pub and convenient for the local walks. However, we found the food to be average and overpriced, although the weekday deal seemed good value at �9.95, if you want 2 courses. The beer was also a bit steep at �3.50 for an indifferent pint of Harveys. The Larkins at �3.40 wasn't too good either. Will try the Anchor nearby the next time we're in the area, although I am not very hopeful that it will be any better. Overall disappointing. Fair enough place, seems friendly with good beer (Larkins and Harveys) though a little on the pricy side. A wonderful welcome, good atmosphere and helpful service was greatfully accepted after a miserable visit to the anchor inn the week previous. The food was without fault, with a vote of approval on the chicken fajitas (from my hard to please wife). we asked to sit in the restaurant to celebrate our 1st anniversary, but were asked to take a seat in the bar as the restaurant was fully booked, but could still enjoy the a la carte menu. we went for a bottle of wine to drink, but must return to try the interesting sounding beer - TEA. all of the staff seemed to be in control of this busy little pub, and particularly enjoyed the light humour and bar room banter of the man at the end of the bar, and the chirpy barman. i think the prices were slightly higher than average, but well and truely worth every penny. all in all i would recommend this place and look forward to our return. four of us visited the haywagon for a late sunday lunch . we were pleased to see a full menu for bar food as the restaurant is closed in the afternoon. the food was very good as was the beer . good size portions and great service too . we will visit again when in the area .